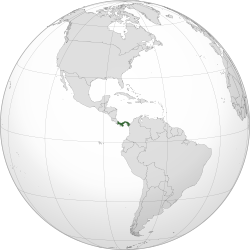 Panama is a country in Central America. Its official name is the Republic of Panama, and it is most famous for the Panama Canal. Countries bordering Panama are Costa Rica in the Northwest and Colombia in the Southeast. Panama is between the Caribbean Sea and the Pacific Ocean. Most of the people in Panama are Roman Catholic (about 80%). The Caribbean coastline has many good natural harbors. However, Cristóbal, at the Caribbean terminus of the canal, had the only important port facilities in the late 1980s. The many islands of the Archipiélago de Bocas del Toro, near the beaches of Costa Rica, made an extensive natural roadstead and shield for the port of Almirante. The over 350 San Blas Islands, near Colombia, are spread out for more than 160 km along the sheltered Caribbean coastline. 50.1%: Multiracial (European, African, Native American, Others). 22.0%: Black African (Bantu-Congo 42%, Akan-Igbo 20%, Mandinga-Wolof 20%, Yoruba 10%, Others 8%). 6.7%: Native American (Embera, Wounaan, Ngobe bugle, Kuna, Naso, Bribri). 8.6%: White European (Spanish-Canarian 74%, German 13%, Italian and Others 13%). 5.5%: Asian (Chinese 93%, Korean and Japanese 7%). The information there **Other** is likely including Arabs, East Indians, and some Russian. For ships, Panama is a flag of convenience. In 2011 Panama had an unemployment rate of 2.7%. Panama also had a food surplus in August 2008. Panama was ranked at number 60 on the Human Development Index in 2008. Panama's economy has experienced an economic boom in recent years. Real gross domestic product (GDP) growth was over 10.4% from 2006–2008. The Panamanian economy has been one of the fastest growing and best managed in Latin America. Latin Business Chronicle has predicted that Panama will be the fastest growing economy in Latin America in the five-year period of 2010–14. Panama is impacted by the global financial crisis. It threatens to damage the social gains made in the past few years. The expansion project of the Panama Canal and the free trade agreement with the United States is expected to boost and extend the economy. Panama is divided into nine provinces. Also, there are five Comarcas (literally: "Shires") populated by a variety of indigenous groups. ↑ Merit Designs (October 7, 2009). "Latin Business Chronicle". Latin Business Chronicle. Retrieved June 26, 2010. This page was last changed on 11 January 2019, at 01:22.